The team at UKMums.TV has discovered the new CBeebies show, Tinpo and we think you’ll love it just as much as we do. 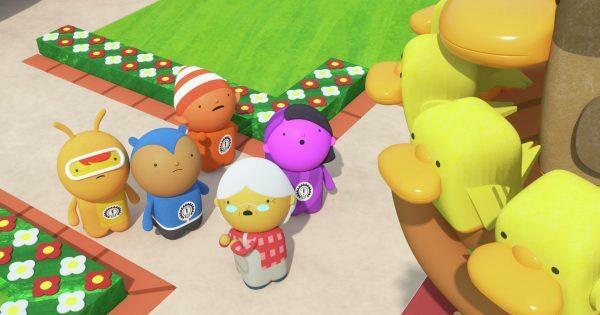 But so that you can be just as resourceful as the characters from Tinpo, we have a handy run down of who’s who in this new colourful animated world. The first thing you need to know is that Tinpotown is populated by the good-natured and hard-working Po. Most of the Po, though, aren’t particularly bright or imaginative and fail to see the bigger picture, so whenever one of them has a problem, they need help from someone more creative and cleverer. That’s Team Tinpo! The solid and reliable leader of his team, Tinpo is the have-a-go public hero of Tinpotown and is curious, imaginative and intelligent, he’s both a dreamer and a doer who leads by example – with enthusiasm, a positive attitude and a sense that whatever he’s doing at that moment is the absolute coolest thing in the world. Doug-Po is not afraid to get her hands dirty or dive into action. She loves to dig, drill and (when allowed) demolish! Doug-Po is the “smash the box” action-taker. But whether it’s destruction or construction, Doug-Po is always 100% committed! A real force of nature, she jumps in with both feet – and all her heart. She can also be a bit of a wise cracker, finishing a job with a witty one liner. As well as Doug-Po being a real livewire, she’s in charge of the team’s bigger, more powerful items of equipment, from the tallest crane to the fleet of Vehi-Tools. Logi-Po’s logo is the international sign for caution and he is always handy with an endless supply of hazard tape and highway cones and is a stickler for safety and doing the job right. While Tinpo sees the world as it could be, Logi-Po only sees the world as it is. He’ll often tell Tinpo the limitations of what can or can’t be done. An orange, little conformist with a narrow comfort zone, Logi-Po’s rigidity and type-A drive serve as sources of comedy – as do his nerdy vocal inflections. On the job site, Logi-Po is willing to work hard and will keep on going even if a project is nominally finished. Hack-Po has facts, stats and information to spare and loves to find things out – and then tell everyone about it! If you need information, Hack-Po has just what you need… and a whole lot more besides! To her, there’s no such thing as a random fact – all information is interesting and potentially useful. Hack-Po is like both M and Q from the James Bond movies, overseeing all the equipment in the home base. She sits in the control seat of her Command Pod, which enables her to reach her team while keeping in touch at all times! An authority figure, who sometimes gives Team Tinpo their assignments and who, on these particular occasions, ultimately approves Tinpo’s ideas. Although she has the best interest of her citizens at heart, she can be unfocused (not helpful when instructing Blockers!) and a bit too eager to please everyone. The Mayor tends to be swayed by whomever spoke last! 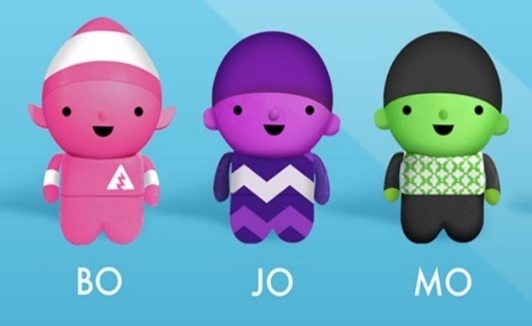 Three of the Kid-Po (who are a little smaller than the rest of our Po) stand out in Tinpotown: Bo, his sister Jo and their friend Mo. They all worship Tinpo and consider him their own personal super-hero! 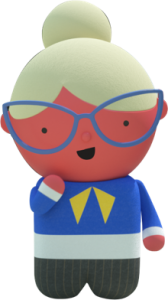 Imaginative Bo is the most like Tinpo – but he hasn’t quite mastered putting his ideas into practice yet! Jo is a gung-ho chatterbox and the terribly shy Mo is a nice, sensitive, cautious kid who is so awed by his hero Tinpo that he hardly ever speaks. The Blockers are the Po in charge of general building work and maintenance. They are, as their name implies, quite literally square, and speak in monotone voices, their sentences punctuated with bleeps and bloops. They follow orders without question or initiative – and that can lead to problems. The Blockers build but with their mono-attitude, they also obstruct and make many errors leaving it to Team Tinpo to fix the mess! 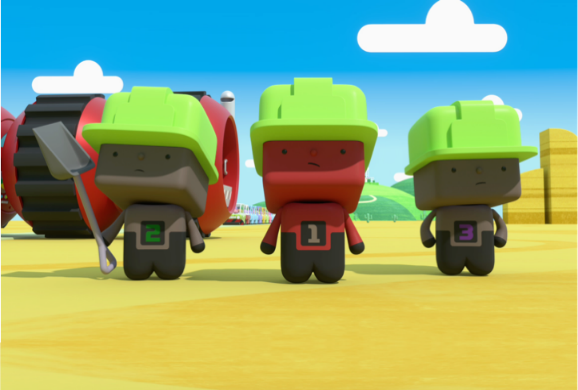 You can watch Tinpo with your kids each day on CBeebies at 06.55am and 3.55 pm.